It's time to open a discussion and start documenting the requirements for this high-demand feature. Automatic Schedules Emails are emails that will go out automatically for things like payment due notices, check-in instructions, etc. Please help us with your thoughts and ideas. Does Bookerville just automatically send these emails straight to the guest? Of course, it should copy the account owner, but actually this is configurable in the Email Template. Or should Bookerville send these to the manager, and let the manager check it out first, then forward it themselves to the guest? Send check-in/check-out instructions some number of days prior to check-in date. Send some kind of thank-you type email some number of days after check-out date. Send payment reminder email some number of days prior to a payment that is due, but not yet paid. Send past-due email some number of days after a payment was due, but not yet paid. Should the "payment reminders" and/or "past due" notices be configurable (Email Templates), or should Bookerville maintain these as a standard? Check-out instruction and feed back solicitation prior to check out. Reminder to owner to refund security deposit a given number of days from check out. Send check-in/check-out instructions with house manual and area tourist information some number of days prior to check-in date. Yes arrival instructions a few dates prior to visit but only if they are PAID in full. Yes a thank you but I would include some option for feedback. Also, a contract and deposit reminder if they're late, asking them to confirm that they still intend to visit. I would love to have an email sent to me that reminded me of payments due, security deposit refund, etc. I am a little leery of the emails going directly to the tenant without me first looking over the numbers to make sure it was calculated correctly, etc. I have had some errors in the past with payments not correctly subtracting, etc. Yes Tiffany we had some bugs in the way Payment Schedules and Pre-Payments were being calculated. We should have started a topic about that in the Bugs section (I will go do that next). We believe those issues have been resolved now, but please do keep an eye on it and report anything that is incorrect. If something is not working properly, we want to know! Automatic Scheduled Emails will be something that you will first setup to only send to you, and only after you've confirmed that the proper emails are going out at the proper times should you then update the templates to start automatically sending to the guests. That's exciting! I just LOVE Bookerville!!! Regarding automated emails with miscalculations. If you look at the invoice amounts as you make the reservation everything to follow should be correct. I agree with John, in the past I've caught a few bugs but I think he's make the needed adjustments and I have not had any problems. Thank you John, loving Bookerville more every day!!! Ok, we have a released a beta version of this feature. We have only enabled it for a select group of our customers for pilot-testing. If anyone wants to participate in this pilot testing, let me know and we will enable it for your account. Hi John. I would love to test the beta version. I feel that the emails should be configurable for me but automatic. ie. I like the Event triggered option but I would like to decide how far in advance each email is sent, what triggers it, and for some guests I would like to add a personal note. I can do that with a simple personal follow-up email. I like to be able to edit my templates as well. thank you for having a user interactive product! pch you should be hooked up now. This new feature is in Beta, and some of the What's This descriptions are not all the way updated (those are the last things we write in the software cycle). So if you have any questions, suggestions, let us know. Hello. I like a lot of the features in the email area. I do have one question. I have my "Key Swap" set to go out 14 days prior to arrival if the guest has paid in full. We had a last minute guest who booked, paid in full, and then did not receive the "Key Swap" information. It is for our booking Confirmation Code: 372-20250-20120905 Any suggestions? Yes, when a booking occurs that is close to the check-in date, some of the Automatic Scheduled Emails can end up having target dates that are in the past. Bookerville won't send these automatically - out of concern that several emails may go out all at once and confuse guests, or the guests might read them out of order, or the emails may disclose information or instructions that don't make sense when they are bunched all together in a single delivery like that. So, any emails that would have been sent in the past in that kind of scenario, are instead listed in red in the Email Correspondence table (bottom-right) in the Booking Details page. Each has a "Send Now" button, so if you want to you can send it manually. Does this make sense? Let us know, and thanks as always for your thoughts and ideas. Hi. Just got my first 2013 booking. Yippee. I then went in to see if I wanted to make any edits to my email templates. I have a question on the Key Swap. In a previous email you said my Key Swap was sent to go out ONLY when someone pays in full, which is what I want. 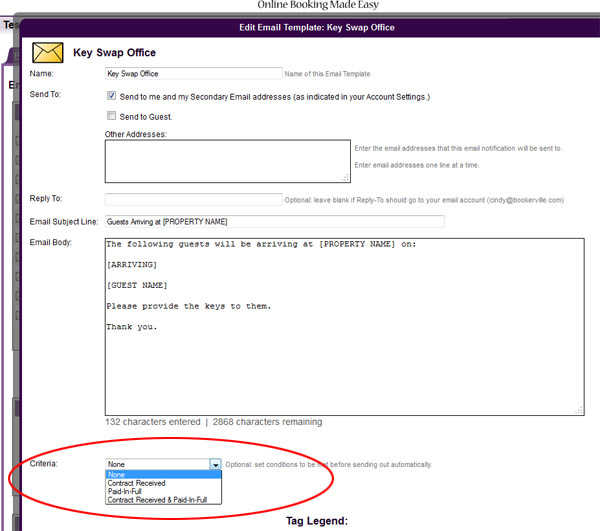 However in my email templates page I do not see a way to set Key Swap to only go when Paid in Full. How do I set that? Currently Key Swap shows as a scheduled email that it is supposed to go out 14 days before check in, with no indication that they need to be paid in full first. What am I missing? You can choose any combination of "Contract Received" and "Paid-In-Full" for the criteria. In your case, it sounds like you want to select "Paid-In-Full", and then the auto email will only be sent if the booking balance is fully paid at that time. The nice thing about setting this on the Email Template itself instead of in the Automatic Scheduled Emails section is that it will also warn you about any criteria that is not met if you try to send the email manually. Let me know if we can help you in making these settings, Ok? Thank you. That helps. So a follow-up question is with the Key Swap and the Confirm Cleaning emails. I currently have the criteria set for Paid-in-full. However, in the Automatic scheduled email section I have them set to go out 14 days before check-in. That seems in conflict with the criteria. Do I NEED them in the automatic schedule if their criteria is set to Paid-in-full? Think of it this way: the Automatic Scheduled Email setting is saying "I'm going to try to send this out 14 days prior to the check-in date. But when that time comes, if the balance is not yet paid, I will not send it." Also, failed emails are communicated in the summary email that is sent to you, along with the reason, so you can follow-up on it manually. We are discussing ways for Bookerville to keep checking each night to see if any failed emails can now be sent (i.e. because it became paid), but this is still in development, so for now you'll have to manage by exception. Hopefully, it's rare that bookings are not paid in full by 14 days out. If it's not rare, then consider changing the Automatic Scheduled Emails, the Payment Schedule, or both. You bet - that's what we're here for! John one more automatic email I would love to see: A reminder to the former tenant asking them to review their stay and giving them the URL. THANKS!! Give me an email or call if you want to walk through setting this up, Ok? Oh, I missed that...Thanks John!